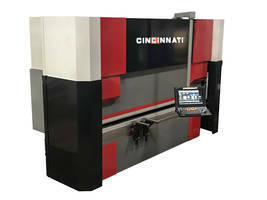 Cincinnati Incorporated’s new 150-ton hybrid press brake model is designed to run quieter, simplify maintenance, and conserve energy by pumping runs only during the working portion of the stroke. The product also requires less than 30 gallons of fire resistant biodegradable hydraulic fluid. The model features a graphical display of tool locations, a ram speed of 550 ipm, 14 inch stroke, 21 inch open height tackle, bend simulation software and a 22 inch touchscreen control. Harrison, OH – October 18, 2018 – Cincinnati Incorporated (CI), a U.S.-based, build-to-order machine tool manufacturer, will introduce a 150-ton version of a new hybrid model press brake at FABTECH 2018 on November 6 - 8 in Atlanta. Additional size models will be released in the future. The company’s metal fabrication products will be displayed in Booth B8439. This hybrid press brake brings the advantages of servo-motor pump technology to CI’s existing lineup of hydraulic and electric drive press brakes. The new drive allows it to run quieter and reduces operating cost with lower energy consumption and simplified maintenance. Unlike fixed-speed induction motors that drive the pump in conventional hydraulic systems, the servo-motor driven pump only runs during the working portion of the stroke, conserving energy while the ram is stationary. In addition to energy savings, it requires less than 30 gallons of fire resistant, readily biodegradable hydraulic fluid. The hybrid press brake provides the productivity and versatility required by today’s fabricators. Job setups are assisted with a graphical display of tool locations, photo and video attachments, hydraulic tool clamping and programmable crowning. Ram speed of 550 ipm and precision ram repeatability of +/-.0002” assure fast and consistent production. The generous 14” stroke and 21” open height tackle challenging part shapes and tool heights. New features found on this press brake are an ergonomic sliding overhead control arm, unique built in storage cabinets, LED lighting, protective cylinder covers and side and rear guards. CI’s CIberlink generates daily log files of machine production with the ability to monitor machine status in real time on a desktop dashboard. Incorporating the best of our current press brake lineup, this hybrid design includes field-proven CI features such as a 22” touchscreen control, bend simulation software with 3D part views, interlocked frame members, programmable ram tilt and CI’s exclusive six axis linear motor backgage. The new hybrid press brake is backed by CI’s factory trained field service technicians and factory phone support with online diagnostics. To see this dynamic hybrid press brake in action, visit us at FABTECH on November 6 – 8 in Booth B8439. ABOUT CINCINNATI INCORPORATED – Cincinnati Incorporated, headquartered in Harrison, OH, provides manufacturers with accurate and dependable laser cutting and automation systems, plasma cutting systems, press brakes, shears and conveyor systems, powder metal presses, and large and small scale additive manufacturing solutions. The company was founded in the late 19th century and is a 2018 “Best Place to Work” recipient. Easybend Pipe Bender eliminates variable refrigerant flow. Programmable 3D CNC Wire Bender minimizes forming limitations. CNC Press Brake has large, open height and stroke. Metalworking Machines offer multiple functions. Xpert 40 Press Brake is used in automatic and manual bending.